In four days, my husband and I visited six Missouri state parks. 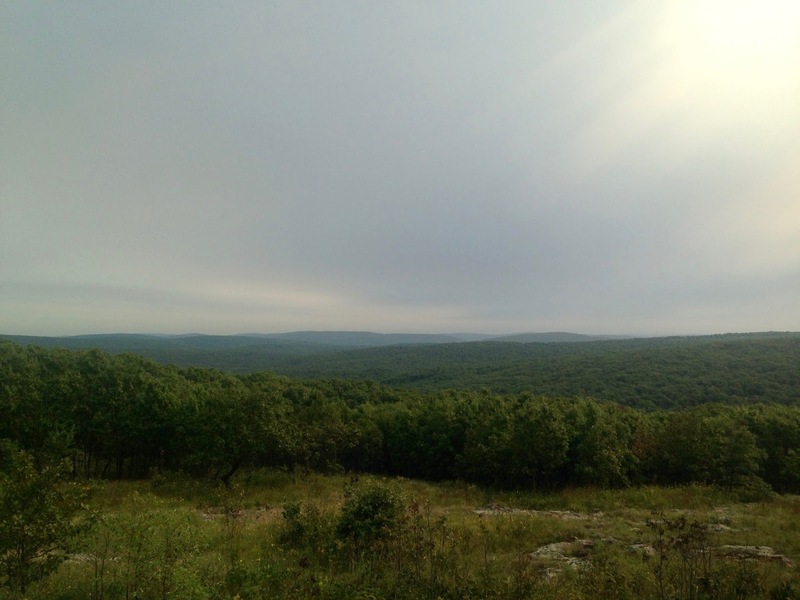 Missouri doesn't charge an admission fee for it's state parks. In many ways, that can be very nice. The most obvious reason is that they are free for everyone to enjoy. The negative side is that most of the parks we visited did not have park rangers or the best rest room facilities. I don't know about you, but I always enjoy stopping in the park office on the way into any state or national park and talking to the rangers to get an idea of what not to miss in the park. I felt most of the time we were in the middle of no where, without any Internet service, and were left completely on our own trying to figure out trails. 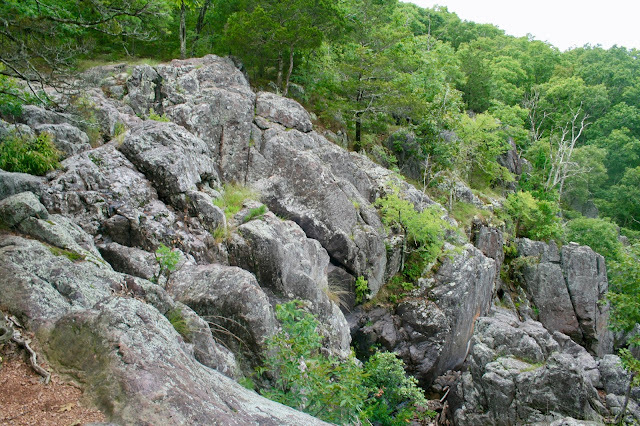 If there is any bit of advice I could give for those interested in hiking in Missouri it would be to do all your research in advance and PRINT trail maps because you won't find them in the majority of the parks. 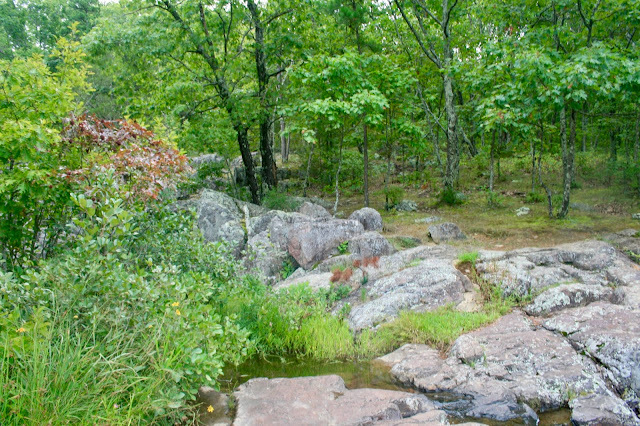 Taum Sauk Mountain was the most rustic, out-in-the-middle-of-nowhere of all the parks we visited. We did do some research on-line before visiting. 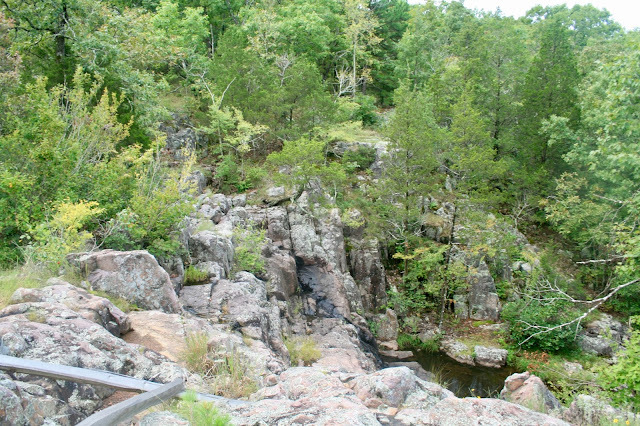 My husband wanted to go to this park because it has a waterfall and it is the highest point in the state of Missouri. 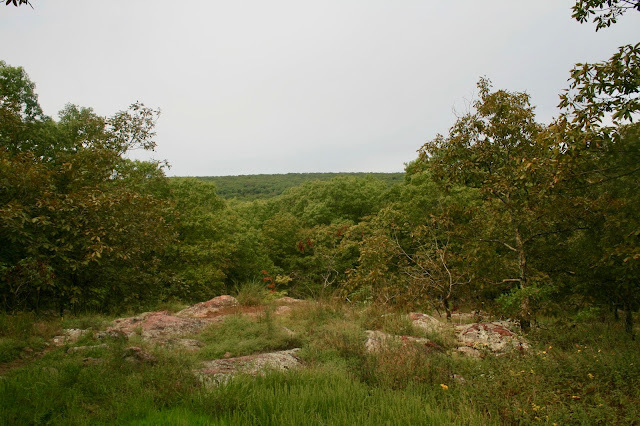 A long gravel road into the park takes you to the top of Taum Sauk Mountain in the St. Francois mountains where you see this view from a lookout. The elevation at this point is 1, 772 feet. 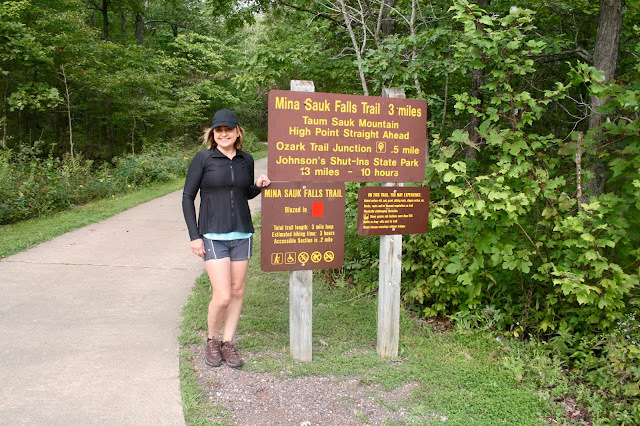 Once we saw the view, it was time to go hike the Mina Sauk Falls Trail. It is a three mile loop that is rugged at times, but the trail was well marked and easy to follow. You can also connect to the Ozark Trail and to Johnson's Shut-Ins State Park from this trail. Our paved road quickly turned into a gravel, then a rocky path through a dense green forest. There were more beautiful look outs on this trail. 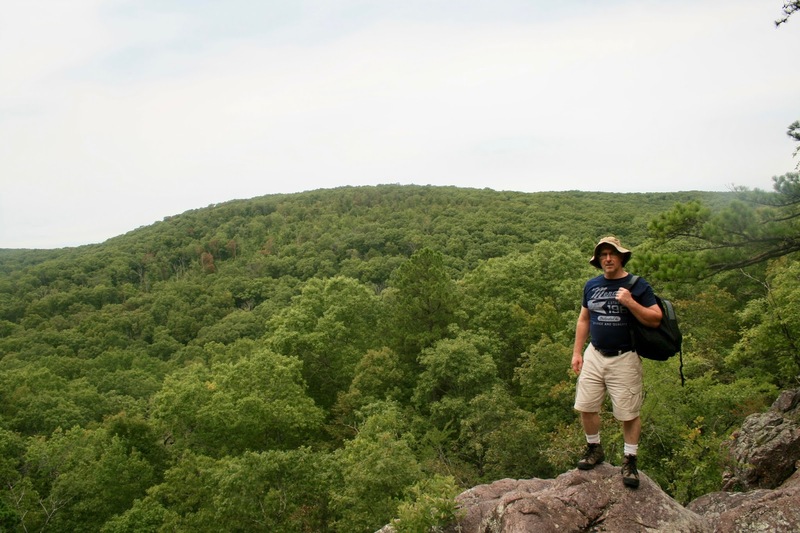 I actually enjoyed the lookouts on the trail more than the famous one by the parking lot! 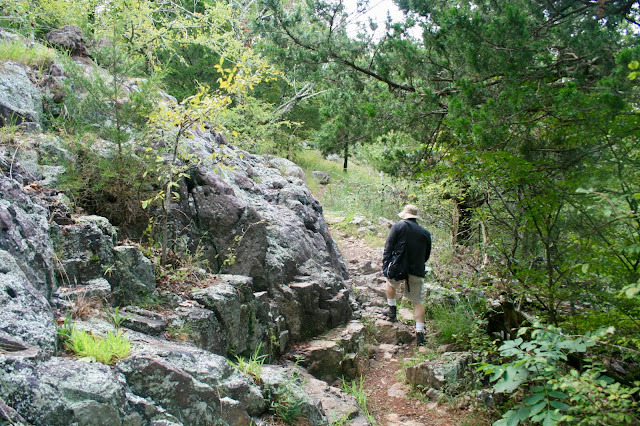 The trail is marked as "Moderate" due to the rocky climb. Mina Sauk Falls is the highest waterfall in Missouri at 132 feet. 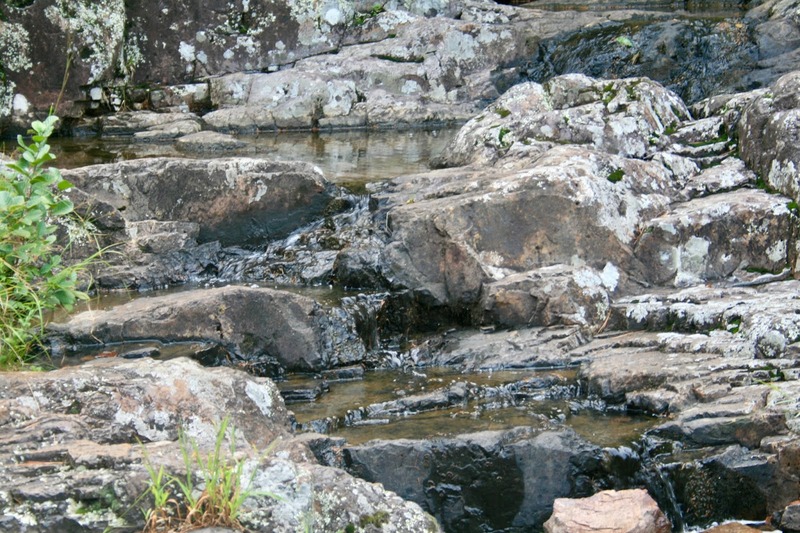 The falls have cascading water only during times of wet weather, so the best time to visit is in the spring. We were there in September, when the falls were reduced to a trickle. There are three main drops to the falls, so it's hard to see the entire falls all at once. If you want a taste of the Ozarks, this is the trail for you. 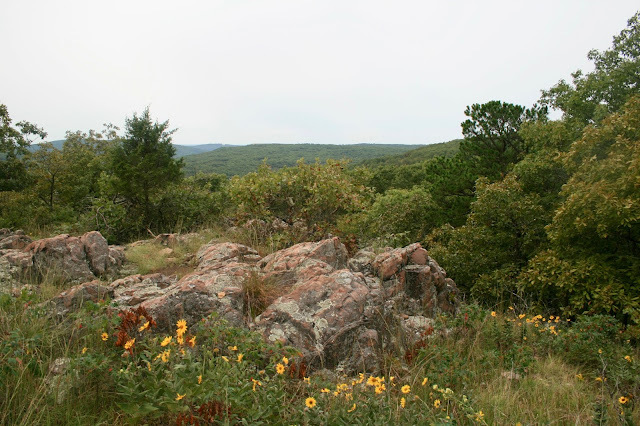 It goes through a variety of terrains from open grasslands, rocky climbs, and dense forests. It is very peaceful and serene, because not many people visit this park (at least not during the off-season when we were there!). We didn't see a single person on this trail. 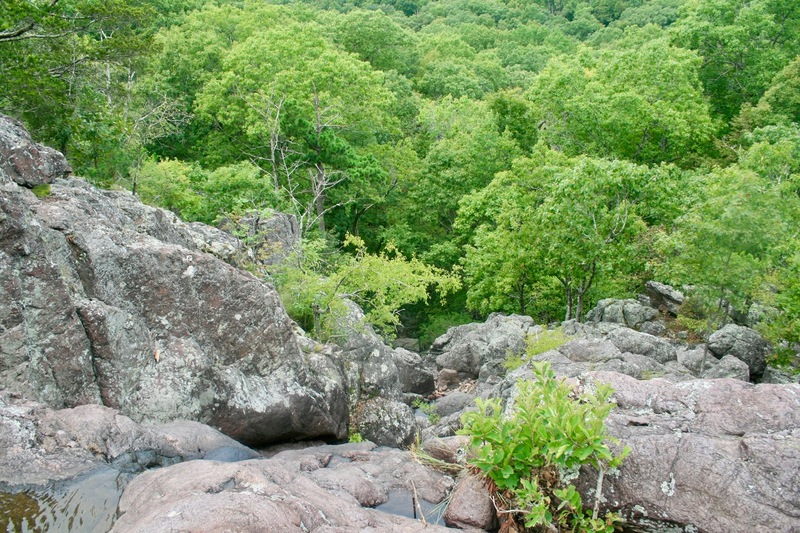 Well, even though we didn't see a lot of water at the falls, the rock formations and views were certainly worth it! Top of the falls looking out. 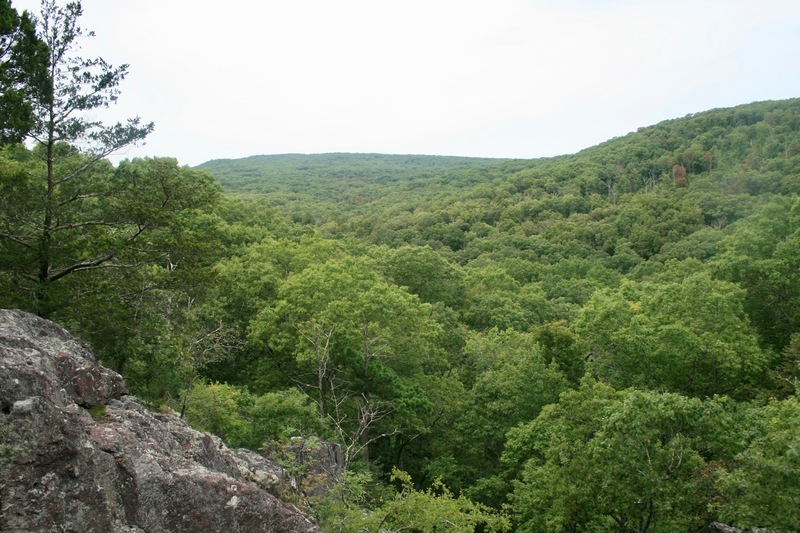 If there's one word I would use to describe the Ozarks it would be "green". Wisconsin is very green too, but we have a lot of pine trees so our forests aren't quite as dense as Missouri's seem to be. 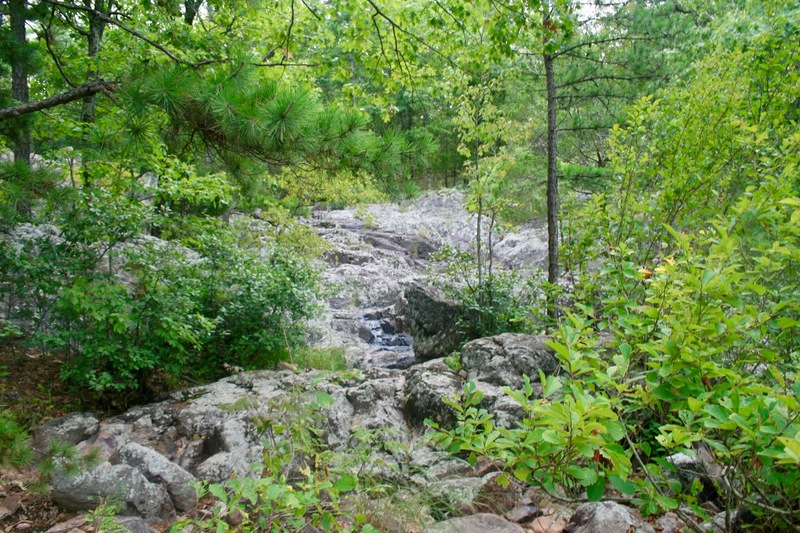 Once we reached the top of the falls, our hiked continued upstream so we were able to enjoy the sound of moving water as we hiked. I found this video on YouTube that was taken during the spring when the falls were active. You can get more of an idea of what the falls are like and also the trail hike than what I was able to show in my pictures. It's less than two minutes long, so easy to watch! There is a look out tower somewhere in this park, but we never saw any signs for it so we never found it. After seeing a YouTube video I don't think I missed much anyway. I think I got the same views without having to climb a tower. There was also a little 1/2 mile jaunt off the Mini Sauk Trail. We didn't take it because the trail was long and strenuous enough as it was and we weren't sure if adding another mile was worth it. 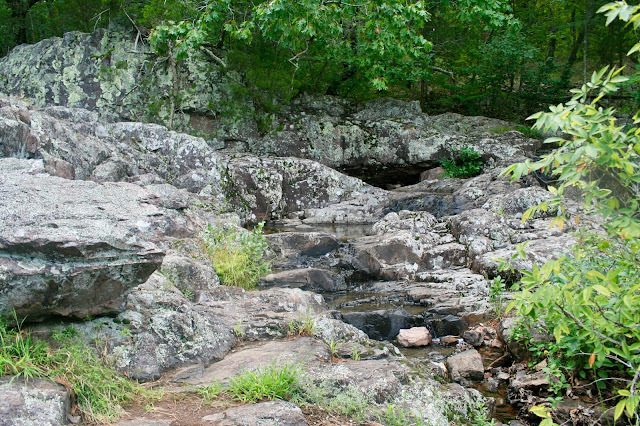 When I returned home I googled Devil's Tollgate (the name of the 1/2 mile loop off of the Mini Sauk Trail) and discovered through Ben's Hikes that it's just a path through a couple of boulders. Cool, but not worth walking an extra mile for. After we finished this strenuous hike, we were hungry for lunch. 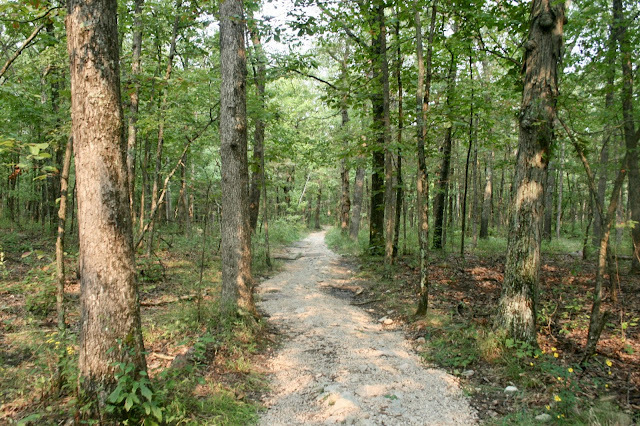 We decided to head for our next destination, Johnson's Shut-Ins State Park to have a picnic lunch before our next hike in the Ozarks. What a nice area! 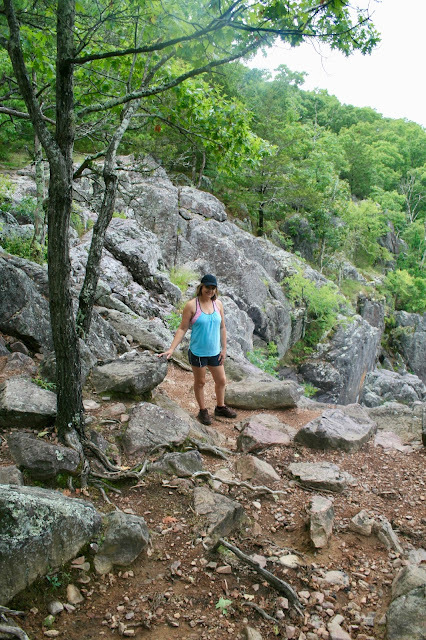 Hard to believe there were no other hikers. But I can imagine there would be more on weekends. I prefer state parks with a ranger station too, it's always helpful to have a trail map and more info. It looks like there could be mountain lions in that area, I know they were sighted here in western Illinois. But glad you didn't come across one. The waterfall looks beautiful! It's funny you should mention mountain lions because several of the parks that we went to were in such remote locations without any other hikers around that I was really nervous about running across a bear or mountain lion. In fact, at one point in our hike there was a strong smell of urine and we I really was scared then because we thought it was bear urine and one must be near by. There was one park we didn't hike at all because there were bear warning signs everywhere, and again, no other hikers. We just took an hour and a half cave tour and then left. Oh beautiful! I would have loved this! We're touring Florida right now in our RV and recently hiked to the highest point in southeast FL, 86 feet above sea level. Ha ha! Thanks Julie. I love Florida and I have been there many times, but I look forward to my husband's retirement so I can do what you're doing! I never made it past Orlando because it's a 24 hour drive just to get there. I would love to explore the keys, Miami, and other spots farther down the state. I wouldn't have even thought about waterfalls in this area!! What fun and gorgeous photos Amy! You are right Jodie! Missouri is not known for waterfalls, which is why we went to this park because we knew how unusual it was. 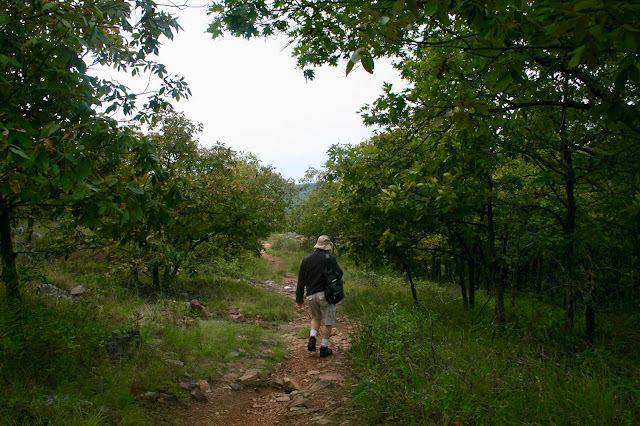 Yes, we've been lost in the woods several times in our lifetime while hiking and it's not fun. It has made me really come to appreciate well marked trails.